Council Directive 82/714/EEC of 4 October 1982 laying down technical requirements for inland waterway vessels (3) introduced harmonised conditions for issuing technical certificates for inland waterway vessels in all Member States, albeit excluding operations on the Rhine. Nevertheless, at European level, various technical requirements for inland waterway vessels have remained in force. Up to now, the coexistence of various international and national regulations has obstructed efforts to ensure mutual recognition of national navigation certificates without the need for an additional inspection of foreign vessels. Furthermore, the standards contained in Directive 82/714/EEC, in part, no longer reflect current technological developments. Essentially, the technical requirements set out in the annexes to Directive 82/714/EEC incorporate the provisions laid down in the Rhine Vessel Inspection Regulation, in the version approved by the Central Commission for Navigation on the Rhine (CCNR) in 1982. The conditions and technical requirements for issuing inland navigation certificates under Article 22 of the Revised Convention for Rhine Navigation have been revised regularly since then and are recognised as reflecting current technological developments. For competition and safety reasons it is desirable, specifically in the interests of promoting harmonisation at European level, to adopt the scope and content of such technical requirements for the whole of the Community's inland waterway network. Account should be taken in this regard of the changes that have occurred in that network. Community inland navigation certificates attesting the full compliance of vessels with the aforementioned revised technical requirements should be valid on all Community inland waterways. It is desirable to ensure a greater degree of harmonisation between the conditions for the issuing of supplementary Community inland navigation certificates by Member States for operations on Zone 1 and 2 waterways (estuaries), as well as for operations on Zone 4 waterways. In the interests of passenger transport safety, it is desirable that the scope of Directive 82/714/EEC be extended to include passenger vessels designed to carry more than 12 passengers, along the lines of the Rhine Vessel Inspection Regulation. In the interests of safety, harmonisation of standards should be at a high level and should be achieved in such a way so as not to result in any reduction in safety standards on any Community inland waterway. It is appropriate to provide for a transitional regime for vessels in service not yet carrying a Community inland navigation certificate when subjected to a first technical inspection under the revised technical requirements established by this Directive. It is appropriate, within certain limits and according to the category of vessel concerned, to determine the period of validity of Community inland navigation certificates in each specific case. The measures necessary for the implementation of this Directive should be adopted in accordance with Council Decision 1999/468/EC of 28 June 1999 laying down the procedures for the exercise of implementing powers conferred on the Commission (4). It is necessary that the measures provided for in Council Directive 76/135/EEC of 20 January 1976 on reciprocal recognition of navigability licenses for inland waterway vessels (5) remain in force for those vessels not covered by this Directive. Given that some vessels fall within the scope of Directive 94/25/EC of the European Parliament and of the Council of 16 June 1994 on the approximation of the laws, regulations and administrative provisions of the Member States relating to recreational craft (6) as well as of this Directive, the annexes of the two Directives should be adjusted by the relevant committee procedures as soon as possible if there are any contradictions or inconsistencies between the provisions of those Directives. In accordance with point 34 of the Interinstitutional Agreement on better law-making (7), Member States are encouraged to draw up, for themselves and in the interests of the Community, their own tables illustrating, as far as possible, the correlation between this Directive and the transposition measures, and to make them public. Zone 4: the waterways listed in Chapter 3 of Annex I. Zone R: those of the waterways referred to in point (a) for which certificates are to be issued in accordance with Article 22 of the Revised Convention for Rhine Navigation as that Article is worded when this Directive enters into force. 2. Any Member State may, after consulting the Commission, modify the classification of its waterways into the zones listed in Annex I. The Commission shall be notified of these modifications at least six months before their entry into force and shall inform the other Member States. vessels for which the product of length (L), breadth (B) and draught (T) is a volume of 100 m3 or more. in the case of recreational craft not covered by all of the Conventions referred to in the first indent, a certificate of the country of which it carries the flag. when operating on other waterways, a Community inland navigation certificate, including, where applicable, the specifications referred to in Article 5. 2. The Community inland navigation certificate shall be drawn up following the model set out in Part I of Annex V and shall be issued in accordance with this Directive. 1. All craft carrying a valid certificate issued pursuant to Article 22 of the Revised Convention for Rhine Navigation may, subject to the provisions of Article 5(5) of this Directive, navigate on Community waterways carrying that certificate only. when operating on Zone 1 and 2 waterways, or, in respect of passenger vessels, when operating on Zone 3 waterways that are not linked to the navigable inland waterways of another Member State, if the Member State concerned has adopted additional technical requirements for those waterways, in accordance with Article 5(1), (2) and (3). 3. The supplementary Community inland navigation certificate shall be drawn up following the model set out in Part II of Annex V and shall be issued by the competent authorities on production of the certificate referred to in paragraph 1 and under the conditions laid down by the authorities competent for the waterways concerned. 1. Each Member State may, after consulting the Commission, and where applicable subject to the requirements of the Revised Convention for Rhine Navigation, adopt technical requirements additional to those in Annex II for craft operating on Zone 1 and 2 waterways within its territory. 2. In respect of passenger vessels operating on Zone 3 waterways within its territory that are not linked to the navigable inland waterways of another Member State, each Member State may maintain technical requirements additional to those in Annex II. Amendments to such technical requirements shall require the prior approval of the Commission. 3. The additional requirements shall be restricted to the subjects listed in Annex III. The Commission shall be notified of these additional requirements at least six months before their entry into force and shall inform the other Member States. 4. Compliance with the additional requirements shall be specified in the Community inland navigation certificate referred to in Article 3 or, where Article 4(2) applies, in the supplementary Community inland navigation certificate. Such proof of compliance shall be recognised on Community waterways of the corresponding zone. Where application of the transitional provisions set out in Chapter 24a of Annex II would result in a reduction in existing national safety standards, a Member State may disapply those transitional provisions in respect of inland waterway passenger vessels operating on its inland waterways that are not linked to the navigable inland waterways of another Member State. In such circumstances, the Member State may require that such vessels operating on its non-linked inland waterways comply fully with the technical requirements set out in Annex II from 30 December 2008. A Member State exercising the provision in point (a) shall inform the Commission of its decision and provide the Commission with details of the relevant national standards applying to passenger vessels operating on its inland waterways. The Commission shall inform the Member States. Compliance with the requirements of a Member State for operating on its non-linked inland waterways shall be specified in the Community inland navigation certificate referred to in Article 3 or, where Article 4(2) applies, in the supplementary Community inland navigation certificate. 6. Craft operating only on Zone 4 waterways shall qualify for the reduced requirements as specified in Chapter 19b of Annex II on all waterways in that zone. Compliance with those reduced requirements shall be specified in the Community inland navigation certificate referred to in Article 3. 7. Each Member State may, after consulting the Commission, allow a reduction of the technical requirements of Annex II for craft operating exclusively on Zone 3 and 4 waterways within its territory. Such a reduction shall be restricted to the subjects listed in Annex IV. Where the technical characteristics of a craft correspond to the reduced technical requirements, this shall be specified in the Community inland navigation certificate or, where Article 4(2) applies, in the supplementary Community inland navigation certificate. The Commission shall be notified of the reductions of the technical requirements of Annex II at least six months before they come into force and shall inform the other Member States. Any craft carrying a certificate issued pursuant to the Regulation for the transport of dangerous substances on the Rhine (the ‘ADNR’) may carry dangerous goods throughout the territory of the Community under the conditions stated in that certificate. Any Member State may require that craft which do not carry such a certificate shall only be authorised to carry dangerous goods within its territory if the craft comply with requirements additional to those set out in this Directive. The Commission shall be notified of such requirements and shall inform the other Member States. craft having a dead weight not exceeding 350 tonnes or craft not intended for the carriage of goods and having a water displacement of less than 100 m3, which were laid down before 1 January 1950 and operate exclusively on a national waterway. 2. Member States may authorise in respect of navigation on their national waterways derogations from one or more provisions of this Directive for limited journeys of local interest or in harbour areas. These derogations and the journeys or area for which they are valid shall be specified in the vessel's certificate. 3. The Commission shall be notified of derogations authorised in accordance with paragraphs 1 and 2 and shall inform the other Member States. 4. Any Member State which, as a result of derogations authorised in accordance with paragraphs 1 and 2, has no craft subject to the provisions of this Directive operating on its waterways shall not be required to comply with Articles 9, 10 and 12. 1. The Community inland navigation certificate shall be issued to craft laid down as from 30 December 2008 following a technical inspection carried out prior to the craft being put into service and intended to check whether the craft complies with the technical requirements laid down in Annex II. 2. The Community inland navigation certificate shall be issued to craft excluded from the scope of Directive 82/714/EEC, but covered by this Directive in accordance with Article 2(1) and (2), following a technical inspection which shall be carried out upon expiry of the craft's current certificate, but in any case no later than 30 December 2018, to check whether the craft complies with the technical requirements laid down in Annex II. In Member States where the validity period of the craft's current national certificate is shorter than five years, such certificate may be issued until five years after 30 December 2008. Any failure to meet the technical requirements laid down in Annex II shall be specified in the Community inland navigation certificate. Provided that the competent authorities consider that these shortcomings do not constitute a manifest danger, the craft referred to in the first subparagraph may continue to operate until such time as those components or areas of the craft which have been certified as not meeting those requirements are replaced or altered, whereafter those components or areas shall meet the requirements of Annex II. 3. Manifest danger within the meaning of this Article shall be presumed in particular when requirements concerning the structural soundness of the shipbuilding, the navigation or manoeuvrability or special features of the craft in accordance with Annex II are affected. Derogations as allowed for in Annex II shall not be identified as shortcomings which constitute a manifest danger. The replacement of existing parts with identical parts or parts of an equivalent technology and design during routine repairs and maintenance shall not be considered as a replacement within the meaning of this Article. 4. Compliance of a craft with the additional requirements referred to in Article 5(1), (2) and (3) shall, where appropriate, be checked during the technical inspections provided for in paragraphs 1 and 2 of this Article, or during a technical inspection carried out at the request of the vessel's owner. 1. Community inland navigation certificates may be issued by the competent authorities of any Member State. 2. Each Member State shall draw up a list indicating which of its authorities are competent for issuing the Community inland navigation certificates and shall notify the Commission thereof. The Commission shall inform the other Member States. 1. The technical inspection referred to in Article 8 shall be carried out by the competent authorities which may refrain from subjecting the craft in whole or in part to technical inspection where it is evident from a valid attestation, issued by a recognised classification society in accordance with Article 1.01 of Annex II, that the craft satisfies in whole or in part the technical requirements of Annex II. Classification societies shall only be recognised if they fulfil the criteria listed in Part I of Annex VII. 2. Each Member State shall draw up a list indicating which of its authorities are competent for carrying out technical inspections and shall notify the Commission thereof. The Commission shall inform the other Member States. 1. The period of validity of Community inland navigation certificates shall be determined in each specific case by the authority competent for issuing such certificates in accordance with Annex II. 2. Each Member State may, in the cases specified in Articles 12 and 16 and in Annex II, issue provisional Community inland navigation certificates. Provisional Community inland navigation certificates shall be drawn up following the model set out in Part III of Annex V.
Each Member State shall lay down the conditions under which a valid Community inland navigation certificate which has been lost or damaged may be replaced. 1. The Community inland navigation certificate shall be renewed on expiry of its period of validity in accordance with the conditions laid down in Article 8. 2. For the renewal of Community inland navigation certificates issued before 30 December 2008, the transitional provisions of Annex II shall apply. 3. For the renewal of Community inland navigation certificates issued after 30 December 2008, the transitional provisions of Annex II which have come into force after the issuing of such certificates shall apply. The validity of a Community inland navigation certificate may exceptionally be extended without a technical inspection in accordance with Annex II by the authority which issued or renewed it. Such extension shall be indicated on that certificate. In the event of major alterations or repairs which affect the structural soundness of the shipbuilding, the navigation or manoeuvrability or special features of the craft in accordance with Annex II, the latter shall again undergo, prior to any further voyage, the technical inspection provided for in Article 8. Following this inspection, a new Community inland navigation certificate stating the technical characteristics of the craft shall be issued or the existing certificate amended accordingly. If this certificate is issued in a Member State other than that which issued or renewed the initial certificate, the competent authority which issued or renewed the certificate shall be informed accordingly within one month. Any decision to refuse to issue or renew a Community inland navigation certificate shall state the grounds on which it is based. The person concerned shall be notified thereof and of the appeal procedure and its time limits in the Member State concerned. Any valid Community inland navigation certificate may be withdrawn by the competent authority which issued or renewed it if the craft ceases to comply with the technical requirements specified in its certificate. The competent authorities of a Member State may, in accordance with Annex VIII, check at any time whether a craft is carrying a certificate valid under the terms of this Directive and satisfies the requirements set out in such certificate or constitutes a manifest danger for the persons on board, the environment or the navigation. The competent authorities shall take the necessary measures in accordance with Annex VIII. Pending the conclusion of agreements on the mutual recognition of navigability certificates between the Community and third countries, the competent authorities of a Member State may recognise the navigability certificates of craft from third countries for navigation on the waterways of that Member State. The issuance of Community inland navigation certificates to craft from third countries shall be carried out in accordance with Article 8(1). 1. The Commission shall be assisted by the Committee established under Article 7 of Council Directive 91/672/EEC of 16 December 1991 on the reciprocal recognition of national boatmasters' certificates for the carriage of goods and passengers by inland waterway (9) (hereinafter referred to as ‘the Committee’). 2. Where reference is made to this paragraph, Articles 3 and 7 of Decision 1999/468/EC shall apply, having regard to the provisions of Article 8 thereof. 1. Any amendments which are necessary to adapt the annexes to this Directive to technical progress or to developments in this area arising from the work of other international organisations, in particular that of the Central Commission for Navigation on the Rhine (CCNR), to ensure that the two certificates referred to in Article 3(1)(a) are issued on the basis of technical requirements which guarantee an equivalent level of safety, or to take account of the cases referred to in Article 5, shall be adopted by the Commission in accordance with the procedure referred to in Article 19(2). Those amendments shall be made rapidly in order to ensure that the technical requirements necessary for the issuing of the Community inland navigation certificate recognised for navigation on the Rhine give a level of safety equivalent to that required for the issuing of the certificate referred to in Article 22 of the Revised Convention for Rhine Navigation. 2. The Commission shall decide on recommendations from the Committee on the issuance of provisional Community inland navigation certificates in accordance with Article 2.19 of Annex II. For those craft outside the scope of Article 2(1) and (2) of this Directive, but falling within the scope of Article 1(a) of Directive 76/135/EEC, the provisions of that Directive shall apply. Additional requirements which were in force in a Member State before 30 December 2008 for craft operating within its territory on Zone 1 and 2 waterways or reduced technical requirements for craft operating within its territory on Zone 3 and 4 waterways which were in force in a Member State before that date shall continue to be in force until additional requirements in accordance with Article 5(1) or reductions in accordance with Article 5(7) of the technical prescriptions of Annex II come into force, but only until 30 June 2009. 1. Member States which have inland waterways as referred to in Article 1(1) shall bring into force the laws, regulations and administrative provisions necessary to comply with this Directive with effect from 30 December 2008. They shall forthwith inform the Commission thereof. 2. Member States shall immediately communicate to the Commission the text of the provisions of national law which they adopt in the field covered by this Directive. The Commission shall inform the other Member States thereof. Member States shall lay down a system of penalties for breaches of the national provisions adopted pursuant to this Directive and shall take all the measures necessary to ensure that these penalties are applied. The penalties thus provided for shall be effective, proportionate and dissuasive. Directive 82/714/EEC shall be repealed with effect from 30 December 2008. This Directive is addressed to the Member States which have inland waterways as referred to in Article 1(1). (1) OJ C 157, 25.5.1998, p. 17. (2) Opinion of the European Parliament of 16 September 1999 (OJ C 54, 25.2.2000, p. 79), Council Common Position of 23 February 2006 (OJ C 166 E, 18.7.2006, p. 1), Position of the European Parliament of 5 July 2006 (not yet published in the Official Journal) and Council Decision of 23 October 2006. (3) OJ L 301, 28.10.1982, p. 1. Directive as last amended by the 2003 Act of Accession. (4) OJ L 184, 17.7.1999, p. 23. Decision as amended by Decision 2006/512/EC (OJ L 200, 22.7.2006, p. 11). (5) OJ L 21, 29.1.1976, p. 10. Directive as last amended by Directive 78/1016/EEC (OJ L 349, 13.12.1978, p. 31). (6) OJ L 164, 30.6.1994, p. 15. Directive as last amended by Regulation (EC) No 1882/2003 (OJ L 284, 31.10.2003, p. 1). (7) OJ C 321, 31.12.2003, p. 1. (8) OJ L 144, 15.5.1998, p. 1. Directive as last amended by Commission Directive 2003/75/EC (OJ L 190, 30.7.2003, p. 6). (9) OJ L 373, 31.12.1991, p. 29. Directive as last amended by Regulation (EC) No 1882/2003. The part of Pomorska Bay southward from the line linking NordPerd on Rugen Island and the lighthouse Niechorze. The part of Gdańska Bay southward from the line linking the lighthouse Hel and the entrance buoy to the port of Baltijsk. Note In the case of vessels whose home port is in another State, account is to be taken of Article 32 of the Ems-Dollart Treaty of 8 April 1960 (BGBl. 1963 II, p. 602). Downstream from the Haudaudine bridge on the Madeleine arm and downstream from the Pirmil bridge on the Pirmil arm. (*) In the case of vessels whose home port is elsewhere, account is to be taken of Article 32 of the Ems-Dollart Treaty of 8 April 1960 (BGBl. 1963 II, p. 602). ‘Community certificate’: a certificate issued to an inland waterway vessel by the competent authority, signifying compliance with the technical requirements of this Directive. Temporary requirements may be adopted, in accordance with the procedure referred to in Article 19(2) of this Directive, where it is found urgently necessary, for the purposes of adaptation to technical progress of inland waterway transport, to allow derogations from the provisions of this Directive before an expected amendment of this Directive itself or to allow tests. The requirements shall be published and shall be valid for a maximum of three years. They shall enter into force at the same time and shall be annulled under the same conditions in all Member States. In order to make the implementation of this Directive easier and uniform, binding administrative instructions for the inspection may be adopted in accordance with the procedure referred to in Article 19(2) of this Directive. 1. Inspection bodies shall be set up by the Member States. 2. Inspection bodies shall consist of a chairman and experts. a nautical expert in possession of a navigation certificate. 3. The Chairman and the experts within each body shall be designated by the authorities in the State in which the body is set up. On taking up their duties, the Chairman and the experts shall submit a written declaration that they will perform them completely independently. No declaration shall be required from officials. 4. Inspection bodies may be assisted by specialist experts in accordance with the national provisions applying. 1. The procedure for making a request for an inspection and establishing the place and time of that inspection fall within the powers of the authorities issuing the Community certificate. The competent authority shall determine which documents are to be submitted. The procedure shall take place in such a way as to ensure that the inspection may be conducted within a reasonable period following the lodging of the request. 2. The owner of a craft that is not subject to this Directive, or his representative, may request a Community certificate. His request shall be met if the vessel fulfils the requirements of this Directive. 1. The owner, or his representative, shall present the craft in an unladen, cleaned and equipped state. He shall provide any assistance needed for the inspection, such as providing an appropriate dinghy and staff, and uncovering any parts of the hull or fittings that are not directly accessible or visible. 2. The inspection body shall demand a dry inspection on the first occasion. That dry inspection may be dispensed with if a classification certificate or a certificate from an approved classification society to the effect that the construction meets its requirements can be produced or if a certificate is produced which shows that a competent authority has already carried out a dry inspection for other purposes. Where there is a periodical inspection or an inspection, as provided for in Article 15 of this Directive, the inspection body may require an inspection out of the water. The inspection body shall conduct trial runs during an initial inspection of motor vessels or convoys or where major changes are made to the propulsion or steering equipment. 3. The inspection body may require further operational tests and other supporting documents. That provision shall also apply during the building of the craft. to craft deviating from the provisions of Part II, as provided for in Article 2.19( 2). 2. The provisional Community certificate shall be drawn up using the model set out in Part III of Annex V where the navigability of the craft, floating establishment or floating object seems to have been adequately ensured. in the cases referred to in paragraph 1(g), for six months. The provisional Community certificate may be extended for six months at a time until the Committee has taken a decision. 10 years in the case of all other craft. The period of validity shall be entered on the Community certificate. 2. In the case of vessels already in operation before the inspection, the competent authority shall set the period of validity of the Community certificate case by case, in the light of the results of the inspection. However, the validity may not exceed the periods specified in paragraph 1. 1. The owner of a craft, or his representative, shall bring to the notice of the competent authority any change in the name or ownership of a craft, any remeasurement, and any change in the official number, registration or home port, and shall send the Community certificate to that authority for amendment. 2. Any competent authority may add any information or change to the Community certificate. 3. Where a competent authority adds any alteration or information to a Community certificate it shall inform the competent authority which issued the Community certificate thereof. 1. Craft shall be subjected to a periodical inspection before expiry of their Community certificate. 2. Following a justified request by the owner or his representative, the competent authority may, by way of an exception, and without any further inspections, grant an extension of the validity of the Community certificate for not more than six months. That extension shall be granted in writing and shall be kept on board the craft. 3. The competent authority shall again lay down the period of validity of the Community certificate in accordance with the results of that inspection. The period of validity shall be entered on the Community certificate and brought to the attention of the authority having issued that Community certificate. 4. If, rather than have its period of validity extended, a Community certificate is replaced by a new version, the earlier Community certificate shall be returned to the competent authority which issued it. The owner of a craft, or his representative, may voluntarily request an inspection at any time. That request for an inspection shall be acted upon. The owner of a craft, or his representative, shall bear all of the costs arising from the inspection of the vessel and the issue of the Community certificate in accordance with a special set of charges drawn up by each of the Member States. The competent authority may allow persons demonstrating a well-founded interest to be informed of the contents of a Community certificate and may issue those persons with extracts or copies of the Community certificates certified as true and designated as such. 1. Competent authorities shall assign an order number to the Community certificates they issue. They shall keep a register in accordance with the model set out in Annex VI of all the Community certificates they issue. 2. Competent authorities shall keep the original, or a copy of all the Community certificates they have issued, and shall enter on these any information and alterations, together with any Community certificate cancellations and replacements. 1. The competent authority having issued a Community certificate shall enter on that Community certificate the official number assigned to that craft by the competent authority of the Member State in which the craft has been registered or has its home port. As far as craft from non-Member States are concerned the official number to be entered on the Community certificate shall be assigned by the competent authority issuing that Community certificate. These requirements shall not apply to recreational craft. 4. The owner of a craft, or his representative, shall apply to the competent authorities for assignment of the official number. The owner or his representative shall also be responsible for affixing the official number entered in the Community certificate and removing it as soon as it is no longer valid. 1. Where the provisions of Part II require the use, or presence, on board a craft of certain materials, installations or items of equipment, or the adoption of certain design aspects or certain arrangements, the competent authority may permit the use, or presence, on board the said craft of other materials, installations or items of equipment, or the adoption of other design features or other arrangements where, in accordance with the procedure referred to in Article 19(2) of this Directive, these are recognised to be equivalent. 2. If, in accordance with the procedure referred to in Article 19(2) of this Directive, the Committee reaches no decision on equivalence, as provided for in paragraph 1, the competent authority may issue a provisional Community certificate. In accordance with the procedure referred to in Article 19(2) of this Directive, the competent authorities shall report to the Committee within one month of issue of the provisional Community certificate in accordance with Article 2.05(1)(g), indicating the name and official number of the craft, the nature of the derogation and the State in which the craft is registered or has its home port. 3. In accordance with the procedure referred to in Article 19(2) of this Directive, the competent authority may, on the basis of a recommendation by the Committee, issue a Community certificate for trial purposes and for a limited period to a specific craft incorporating new technical specifications that derogate from the requirements of Part II, provided those specifications offer equivalent safety. 4. The equivalences and derogations referred to in paragraphs 1 and 3 shall be entered in the Community certificate. The Commission shall be informed thereof. Vessels shall be built in accordance with good shipbuilding practice. 1. The hull shall be sufficiently strong to withstand all of the stresses to which it is normally subjected. In the case of newly built vessels or major conversions affecting vessel strength, adequate strength shall be demonstrated by presenting design calculation proof. That proof is not required where a classification certificate or a declaration from an approved classification society is submitted. f = 1 may be taken for the frame spacing when calculating the minimum thickness of the side plates. However, the minimum thickness of the bilge plates may in no case be less than that of the bottom plates and side plates. 1,0 for all other types of structure. In longitudinally framed vessels with double bottom and wing voids, the minimum value calculated for the plate thickness in accordance with the formulae in paragraph (b) may be reduced to a calculated value certified by an approved classification society for sufficient hull strength (longitudinal, lateral and local strength). Plates shall be renewed if bottom, bilge or side plates are below the permissible value laid down in this way. The minimum values calculated in accordance with the method are limit values taking account of normal, uniform wear, and provided that shipbuilding steel is used and that the internal structural components such as frames, frame floor, main longitudinal and transverse structural members are in a good state and that the hull shows no indication of any overloading of the longitudinal strength. As soon as these values are no longer achieved, the plates in question shall be repaired or replaced. However, lesser thicknesses, of not more than 10 % reduction from calculated values, are acceptable locally for small areas. 2. Where a material other than steel is used for the construction of the hull, it shall be proved by calculation that the hull strength (longitudinal, lateral and local strength) equals at least the strength that would result from the use of steel under the assumption of minimum thickness in accordance with paragraph1. If a certificate of class or a declaration issued by a recognised classification society is presented, a proof by calculation may be dispensed with. 3. The stability of vessels shall correspond to their intended use. A collision bulkhead at a suitable distance from the bow in such a way that the buoyancy of the laden vessel is ensured, with a residual safety clearance of 100 mm if water enters the watertight compartment ahead of the collision bulkhead. As a general rule, the requirement referred to in paragraph 1 shall be considered to have been met if the collision bulkhead has been installed at a distance of between 0,04 L and 0,04 L + 2 m measured from the forward perpendicular in the plane of maximum draught. If this distance exceeds 0,04 L + 2 m, the requirement set out in paragraph 1 shall be proved by calculation. The distance may be reduced to 0,03 L. In that case the requirement referred to in paragraph 1 shall be proved by calculation on the assumption that the compartment ahead of the collision bulkhead and those adjacent have all been filled with water. An aft-peak bulkhead at a suitable distance from the stern where the vessel length L exceeds 25 m.
2. No accommodation or installations needed for vessel safety or operation may be located ahead of the plane of the collision bulkhead. This requirement shall not apply to anchor gear. 3. The accommodation, engine rooms and boiler rooms, and the workspaces forming part of these shall be separated from the holds by watertight transverse bulkheads that extend up to the deck. 4. The accommodation shall be separated from engine rooms, boiler rooms and holds in a gastight manner and shall be directly accessible from the deck. If no such access has been provided an emergency exit shall also lead directly to the deck. 5. The bulkheads specified in paragraphs 1 and 3 and the separation of areas specified in paragraph 4 shall not contain any openings. ‘Door to be closed immediately after use’. 6. The water inlets and discharges, and the pipework connected to these, shall be such that no unintentional ingress of water into the vessel is possible. 7. The foresections of vessels shall be built in such a way that the anchors neither wholly nor partly protrude beyond the side plating. 1. Engine or boiler rooms shall be arranged in such a way that the equipment therein can be operated, serviced and maintained easily and safely. 2. The liquid-fuel or lubricant bunkers and passenger areas and accommodation may not have any common surfaces which are under the static pressure of the liquid when in normal service. 3. Engine room, boiler room and bunker bulkheads, ceilings and doors shall be made of steel or another equivalent non-combustible material. Insulation material used in engine rooms shall be protected against the intrusion of fuel and fuel vapours. All openings in walls, ceilings, and doors of engine rooms, boiler rooms, and bunker rooms shall be such that they can be closed from outside the room. The locking devices shall be made from steel or an equivalently non-combustible material. 4. Engine and boiler rooms and other premises in which flammable or toxic gases are likely to escape shall be capable of being adequately ventilated. 5. Companionways and ladders providing access to engine and boiler rooms and bunkers shall be firmly attached and be made of steel or another shock-resistant and non-combustible material. 6. Engine and boiler rooms shall have two exits of which one may be an emergency exit. a fire extinguisher is located at the servicing point that is furthest removed from the exit door and also, by way of derogation from Article 10.03(1)(e), where the installed power of the engines does not exceed 100 kW. 7. The maximum permissible sound pressure level in the engine rooms shall be 110 dB(A). The measuring points shall be selected as a function of the maintenance work needed during normal operation of the plant located therein. 1. The safety clearance shall be at least 300 mm. 2. The safety clearance in the case of vessels whose openings cannot be closed by spray-proof and weathertight devices, and for vessels sailing with their holds uncovered, shall be increased in such a way that each of those openings shall be at least 500 mm from the plane of maximum draught. 1. The freeboard of vessels with a continuous deck, without sheer and superstructures, shall be 150 mm. is the effective aft sheer in mm. is the effective length, in m, of a superstructure in the aft quarter of vessel length L.
is the height, in m, of the superstructure involved. However, in the case of hatches, h is obtained by reducing the height of the coamings by half of the safety distance according to Article 4.01(1) and (2). In no case will a value exceeding 0,36 m be taken for h.
is less than 0,6 the effective length le of the superstructure will be zero. 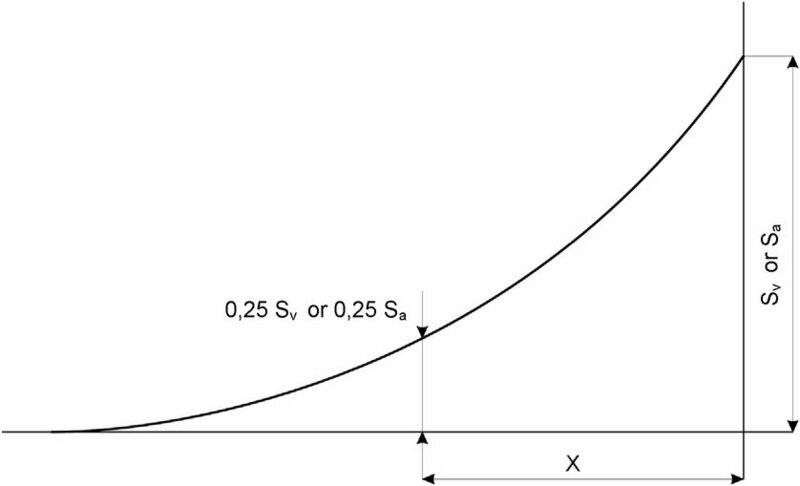 is the abscissa, measured from the extremity of the point where the sheer is 0,25 Sv or 0,25 Sa (see figure). However, coefficient p will not be taken to be more than 1. 6. If βa · Sea is greater than βv · Sev, the value βv · Sev of will be taken as being the value for βa · Sea. In view of the reductions referred to in Article 4.02 the minimum freeboard shall be not less than 0 mm. 1. The plane of maximum draught shall be determined in such a way that the specifications concerning minimum freeboard and minimum safety clearance are both met. However, for safety reasons, the inspection body may lay down a greater value for the safety clearance or freeboard. The plane of maximum draught shall be determined at least for Zone 3. 2. The plane of maximum draught shall be indicated by means of highly visible, indelible draught marks. 3. 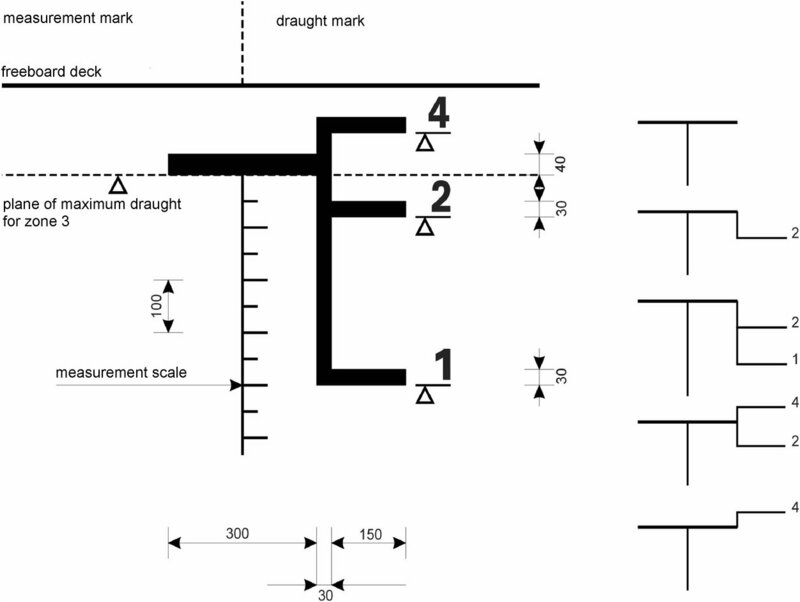 The draught marks for Zone 3 shall consist of a rectangle 300 mm long and 40 mm deep, the base of which is horizontal and coincides with the plane of the maximum authorised draught. Any differing draught marks shall include such a rectangle. 4. Vessels shall have at least three pairs of draught marks, of which one pair shall be centrally located and the two others located, respectively, at a distance from the bow and stern that is equal to roughly one-sixth of the length. where vessels are not intended for the carriage of goods, a pair of marks located roughly halfway along the vessel will suffice. 5. Marks or indications which cease to be valid following a further inspection shall be deleted or marked as being no longer valid under the supervision of the inspection body. If a draught mark should disappear, it may only be replaced under the supervision of an inspection body. 6. Where a vessel has been measured in implementation of the 1966 Convention on the Measurement of Inland Navigation Vessels and the plane of the measurement marks meets the requirements of this Directive, those measurement marks shall take the place of the draught marks; this shall be mentioned in the Community certificate. 7. For vessels operating on zones of inland waterways other than Zone 3 (Zones 1, 2 or 4) the bow and stern pairs of draught marks provided for in paragraph 4 shall be supplemented by adding a vertical line to which one or, in the case of several zones, several additional draught lines 150 mm long shall be affixed towards the bow, in relation to the draught mark for Zone 3. This vertical line and the horizontal line shall be 30 mm thick. In addition to the draught mark towards the bow of the vessel, the relevant zone numbers shall be indicated in lettering 60 mm high × 40 mm deep (see Figure 1). If the plane of maximum draught for Zone 3 of a vessel is determined by assuming that the holds may be closed in such a way as to make them spray-proof and weathertight, and if the distance between the plane of maximum draught and the upper edge of the coamings is less than 500 mm, the maximum draught for sailing with uncovered holds shall be determined. 1. Vessels whose draught may exceed 1 m shall bear a draught scale on each of their sides towards the stern; they may bear additional draught scales. 2. The zero points on each draught scale shall be taken vertically to this within the plane running parallel to the plane of maximum draught passing through the lowest point of the hull or of the keel where such exists. The vertical distance above the zero point shall be graduated in decimetres. That graduation shall be located on each scale, from the unladen water line up to 100 mm above the maximum draught by means of punched or chiselled marks, and shall be painted in the form of a highly-visible band in two alternating colours. That graduation shall be identified by figures at a distance of every five decimetres marked next to the scale as well as at the top of the scale. 3. The two stern measurement scales affixed pursuant to the Convention referred to in Article 4.04 (6), may replace the draught scales, provided that they include a graduation that meets the requirements plus, where appropriate, figures indicating the draught. Vessels and convoys shall display adequate navigability and manoeuvrability. Unpowered vessels intended to be towed shall meet the specific requirements laid down by the inspection body. Powered vessels and convoys shall meet the requirements set out in Articles 5.02 to 5.10. 1. Navigability and manoeuvrability shall be checked by means of navigation tests. Compliance with the requirements of Articles 5.06 to 5.10 shall, in particular, be examined. 2. The inspection body may dispense with all or part of the tests where compliance with the navigability and manoeuvrability requirements is proven in another manner. 1. The navigation tests referred to in Article 5.02 shall be carried out on areas of inland waterways that have been designated by the competent authorities. 2. Those test areas shall be situated on a stretch of flowing or standing water that is if possible straight, at least 2 km long and sufficiently wide and is equipped with highly-distinctive marks for determining the position of the vessel. 3. It shall be possible for the inspection body to plot the hydrological data such as depth of water, width of navigable channel and average speed of the current in the navigation area as a function of the various water levels. During navigation tests, vessels and convoys intended to carry goods shall be loaded to at least 70 % of their tonnage and loading, distributed in such a way as to ensure a horizontal attitude as far as possible. If the tests are carried out with a lesser load the approval for downstream navigation shall be restricted to that loading. 1. During the navigation test, all of the equipment referred to in items 34 and 52 of the Community certificate which may be actuated from the wheelhouse may be used, apart from anchors. 2. However, during the test involving turning into the current referred to in Article 5.10, bow anchors may be used. 1. Vessels and convoys shall achieve a speed in relation to the water of at least 13 km/h. That condition is not mandatory where pusher tugs are operating solo. 2. The inspection body may grant exemptions to vessels and convoys operating solely in estuaries and ports. 1. Vessels and convoys shall be able to stop facing downstream in good time while remaining adequately manoeuvrable. 2. Where vessels and convoys are not longer than 86 m and not wider than 22.90 m the stopping capacity mentioned above may be replaced by turning capacity. 3. The stopping capacity shall be proved by means of stopping manoeuvres carried out within a test area as referred to in Article 5.03 and the turning capacity by turning manoeuvres in accordance with Article 5.10. Where the stopping manoeuvre required by Article 5.07 is carried out in standing water it shall be followed by a navigation test while going astern. Vessels and convoys shall be able to take evasive action in good time. That capacity shall be proven by means of evasive manoeuvres carried out within a test area as referred to in Article 5.03. Vessels and convoys not exceeding 86 m in length or 22,90 m in breadth shall be able to turn in good time. That turning capacity may be replaced by the stopping capacity referred to in Article 5.07. The turning capacity shall be proven by means of turning manoeuvres against the current. 1. Vessels shall be fitted with a reliable steering system which provides at least the manoeuvrability required by Chapter 5. 2. Powered steering systems shall be designed in such a way that the rudder cannot change position unintentionally. 3. The steering system as a whole shall be designed for permanent lists of up to 15° and ambient temperatures from — 20 oC to + 50 oC. 4. The component parts of the steering system shall be rugged enough to always be able to withstand the stresses to which they may be subjected during normal operation. No external forces applied to the rudder shall impair the operating capacity of the steering apparatus and its drive unit. 5. The steering system shall incorporate a powered drive unit if so required by the forces needed to actuate the rudder. 6. A steering apparatus with powered drive unit shall be protected against overloads by means of a system that restricts the torque applied by the drive unit. 7. The penetrations for the rudder stocks shall be so designed as to prevent the spread of water-polluting lubricants. 1. If the steering apparatus has a powered drive unit, it shall be possible to bring a second independent drive unit, or manual drive, into use within five seconds if the steering apparatus drive unit fails or malfunctions. 2. If the second drive unit or manual drive is not placed in service automatically, it shall be possible to do so immediately by means of a single operation by the helmsman that is both simple and quick. 3. The second drive unit or manual drive shall ensure the manoeuvrability required by Chapter 5 as well. 1. No other power consumers may be connected to the hydraulic steering apparatus drive unit. Where there are two independent drive units, such a connection to one of the units is however acceptable if the consumers are connected to the return line and may be disconnected from the drive unit by means of an isolating device. 2. Where there are two hydraulic drive units, a separate hydraulic reservoir is needed for each of the two units. However, double reservoirs are acceptable. Hydraulic reservoirs shall be fitted with a warning system that monitors any drop in the oil level below the lowest content level needed for reliable operation. 3. The pilot valve does not have to be duplicated if this can be actuated manually or by manually-controlled hydraulic actuation from the wheelhouse. 4. The dimensions, design and arrangement of the pipework shall as far as possible exclude mechanical damage or damage resulting from fire. 5. As far as hydraulic drive units are concerned, no separate pipework system shall be required for the second unit if independent operation of the two units is guaranteed and if the pipework system is able to withstand a pressure of at least 1.5 times that of the maximum service pressure. 6. Flexible piping is only permitted where its use is essential in order to damp vibrations or to allow freedom of movement of components. It shall be designed for a pressure that is at least equal to the maximum service pressure. 1. Steering systems fitted with two powered drive units shall have at least two power sources. 2. If the second power source for the powered steering apparatus is not constantly available while the vessel is under way, a buffer device carrying adequate capacity shall provide back-up during the period needed for start-up. 3. In the case of electrical power sources, no other power consumers may be supplied by the main power source for the steering system. 1. The manual wheel shall not be driven by a powered drive unit. 2. Regardless of rudder position, a kick-back of the wheel shall be prevented when the manual drive is engaged automatically. 1. Where the thrust vectoring of rudder-propeller, water-jet, cycloidal-propeller or bow-thruster installations is remotely actuated by electric, hydraulic or pneumatic means, there shall be two actuation systems, each independent of the other, between the wheelhouse and the propeller- or thruster-installation which, mutatis mutandis, meet the requirements of Articles 6.01 to 6.05. Such systems are not subject to this paragraph if they are not needed in order to achieve the manoeuvrability required by Chapter 5 or if they are only needed for the stopping test. 2. Where there are two or more rudder-propeller, water-jet or cycloidal-propeller installations that are independent of each other the second actuation system is not necessary if the vessel retains the manoeuvrability required by Chapter 5 if one of the systems fails. 1. The rudder position shall be clearly displayed at the steering position. If the rudder-position indicator is electric it shall have its own power supply. failure of the required buffer devices. 1. Rate-of-turn regulators and their components shall meet the requirements laid down in Article 9.20. 2. The proper functioning of the rate-of-turn regulator shall be displayed at the steering position by means of a green indicating light. Any lack of or unacceptable variations in the supply voltage and an unacceptable decrease in the speed of rotation of the gyroscope shall be monitored. 3. Where, in addition to the rate-of-turn regulator, there are other steering systems, it shall be possible to clearly distinguish at the steering position which of these systems has been activated. It shall be possible to shift from one system to another immediately. The rate-of-turn regulator shall not have any influence on these other steering systems. 4. The electricity supply to the rate-of-turn regulator shall be independent of other power consumers. 5. The gyroscopes, detectors and rate-of-turn indicators used in the rate-of-turn regulators shall meet the minimum requirements of the minimum specifications and test conditions concerning rate-of-turn displays for inland waterways, as laid down in Annex IX. operating instructions for the steering system. 2. Operation of the entire steering system shall be checked by means of a navigation test. If a rate-of-turn regulator is installed it shall be checked that a predetermined course can be reliably maintained and that bends can be negotiated safely. 1. Wheelhouses shall be arranged in such a way that the helmsman may at all times perform his task while the vessel is under way. 2. Under normal operating conditions, sound pressure generated by the vessel and measured at the level of the helmsman's head at the steering position shall not exceed 70 dB(A). 3. Where a wheelhouse has been designed for radar navigation by one person, the helmsman shall be able to accomplish his task while seated and all of the display or monitoring instruments and all of the controls needed for operation of the vessel shall be arranged in such a way that the helmsman may use them comfortably while the vessel is under way without leaving his position or losing sight of the radar screen. 1. There shall be an adequately unobstructed view in all directions from the steering position. 2. The area of obstructed vision for the helmsman ahead of the vessel in an unladen state with half of its supplies but without ballast shall not exceed two vessel lengths or 250 m, whichever is less, to the surface of the water over an arc from abeam on either side through right ahead of the vessel. Optical and electronic means for reducing the area of obstructed vision may not be taken into account during the inspection. To further reduce any area of obstructed vision, only suitable electronic devices shall be used. 3. The helmsman's field of unobstructed vision at his normal position shall be at least 240° of the horizon and at least 140° within the forward semicircle. No window frame, post or superstructure shall lie within the helmsman's usual axis of vision. Even in the case where a field of unobstructed vision of at least 240° of the horizon is provided, the inspection body may require other measures and in particular the installation of suitable auxiliary optical or electronic devices if no sufficiently unobstructed view is provided towards the rear. The height of the lower edge of the side windows shall be kept as low as possible and the height of the upper edge of the side and rear windows shall be kept as high as possible. In determining whether the requirements in this Article for visibility from the wheelhouse are met, the helmsman shall be assumed to have a height of eye of 1 650 mm above the deck at the steering position. 4. The upper edge of the forward facing windows of the wheelhouse shall be high enough to allow a person at the steering position with height of eye of 1 800 mm a clear forward view to at least 10 degrees above the horizontal at eye-level height. 5. There shall in all weathers be suitable means of providing a clear view through the windscreen. 6. The glazing used in wheelhouses shall be made of safety glass and have a light transmission of at least 75 %. To avoid reflections, the bridge front windows shall be glare-free and inclined from the vertical plane, so as to form an outward angle of not less than 10° and not more than 25°. 1. Control equipment needed to operate the vessel shall be brought into its operating position easily. That position shall be unambiguously clear. 2. Monitoring instruments shall be easily legible. It shall be possible to adjust their lighting steplessly down to their extinction. Light sources shall be neither intrusive nor impair the legibility of the monitoring instruments. 3. There shall be a system for testing the warning and indicating lights. 4. It shall be possible to clearly establish whether a system is in operation. If its functioning is indicated by means of an indicating light, this shall be green. 5. Any malfunctioning or failure of systems that require monitoring shall be indicated by means of red warning lights. 6. An audible warning shall sound at the same time that a red warning light lights up. Audible warnings may be given by a single, collective signal. The sound pressure level of that signal shall exceed the maximum sound pressure level of the ambient noise at the steering position by at least 3 dB(A). 7. The audible warning shall be capable of being switched off after a malfunction or failure has been acknowledged. Such shutdown shall not prevent the alarm signal from being triggered by other malfunctions. The red warning lights shall only go out when the malfunction has been corrected. 8. The monitoring and indicating devices shall be automatically switched to an alternative power supply if their own power supply fails. 1. It shall be possible to control and monitor the main engines and steering systems from the steering position. Main engines fitted with a clutch which can be actuated from the steering position, or driving a controllable pitch propeller which can be controlled from the steering position, need only to be capable of being started up and shut down from the engine room. 2. The control for each main engine shall take the form of a single lever which prescribes an arc within a vertical plane that is approximately parallel to the longitudinal axis of the vessel. Movement of that lever towards the bow of the vessel shall cause forward motion, whereas movement of the lever towards the stern shall cause the vessel to go astern. Clutch engagement and reversal of the direction of motion shall take place about the neutral position of that lever. The lever shall catch in the neutral position. 3. The direction of the propulsion thrust imparted to the vessel and the rotational speed of the propeller or main engines shall be displayed inside wheelhouses that have been designed for radar navigation by one person. 4. The indicating and monitoring devices required by Article 6.07(2), Article 8.03( 2), and Article 8.05 (13), shall be located at the steering position. 5. Vessels with wheelhouses designed for radar navigation by one person shall be steered by means of a lever. It shall be possible to move that lever easily by hand. The position of the lever in relation to the longitudinal axis of the vessel shall correspond precisely to the position of the rudder blades. It shall be possible to release hold of the lever in any given position without that of the rudder blades changing. The neutral position of the lever shall be clearly perceptible. 6. Where the vessel is fitted with bow rudders or special rudders, particularly for going astern, these shall be actuated in wheelhouses designed for radar navigation by one person by special levers which, mutatis mutandis, meet the requirements set out in paragraph 5. That requirement shall also apply where, in convoys, the steering system fitted to craft other than those powering the convoy is used. 7. Where rate-of-turn regulators are used, it shall be possible for the rate-of-turn control to be released in any given position without altering the speed selected. The control shall turn through a wide enough arc to guarantee adequately precise positioning. The neutral position shall be clearly perceptible from the other positions. The scale illumination shall be steplessly variable. 8. The remote-control equipment for the entire steering system shall be installed in a permanent manner and be arranged in such a way that the course selected is clearly visible. If the remote control equipment can be disengaged, it shall be equipped with an indicating device displaying the respective operational conditions ‘in service’ or ‘out of service’. The disposition and manipulation of the controls shall be functional. For systems that are subsidiary to the steering system, such as active bow thrusters, remote-control equipment not permanently installed shall be acceptable provided that such a subsidiary installation can be activated by means of an override at any time within the wheelhouse. 9. In the case of rudder-propeller, water-jet, cycloidal-propeller and bow-thruster systems, equivalent devices shall be acceptable as control, indicating and monitoring devices. The requirements set out in paragraphs 1 to 8 shall apply, mutatis mutandis, in view of the specific characteristics and arrangements selected for the abovementioned active steering and propulsion units. The position of the indicating device shall clearly show for each installation the direction of the thrust acting on the vessel or the direction of the jet . ‘light signals’ means the lights accompanying the sound signals and assigned to the blue panel. 2. Current indicating lights or other equivalent devices, such as repeater lights, for monitoring the navigation lights shall be installed in the wheelhouse unless that monitoring can be performed direct from the wheelhouse. 3. In wheelhouses designed for radar navigation by one person, repeater lights shall be installed on the control panel in order to monitor the navigation lights and the light signals. Switches of navigation lights shall be included in the repeater lights or be adjacent to these and shall be clearly assigned to them. The arrangement and colour of the repeater lights for the navigation lights and light signals shall correspond to the actual position and colour of those lights and signals. The failure of a navigation light or light signal to function shall cause the corresponding repeater light either to go out or to provide a signal in another manner. 4. In wheelhouses designed for radar navigation by one person it shall be possible to activate the sound signals by a foot operated switch. That requirement shall not apply to the ‘do not approach’ signal in accordance with the applicable navigational authority regulations of the Member States. 5. Navigation lights shall meet the requirements set out in Annex IX, Part I. 1. The radar equipment and rate-of-turn indicators shall be of a type that has been approved by the competent authority. The requirements concerning installation and operational testing of radar equipment and rate-of-turn indicators, as laid down in Annex IX, shall be met. Inland ECDIS equipment which can be operated in navigation mode shall be regarded as radar equipment. In addition the requirements of the Inland ECDIS standard shall be met. The rate-of-turn indicator shall be located ahead of the helmsman and within his field of vision. the rate-of-turn indicator shall be installed directly above or below the radar image or be incorporated into this. 1. Where vessel wheelhouses have been designed for radar navigation by one person, reception from the vessel-vessel networks and that of nautical information shall be via a loudspeaker, and outgoing communications via a fixed microphone. Send/receive shall be selected by means of a push-button. It shall not be possible to use the microphones of those networks for the public correspondence network. 2. Where vessel wheelhouses designed for radar navigation by one person are equipped with a radio telephone system for the public correspondence network, reception shall be possible from the helmsman's seat. There shall be internal communication facilities on board vessels with a wheelhouse designed for radar navigation by one person. Reception at all positions of these internal communication links shall be via loudspeaker, and transmission shall be via a fixed microphone. The link with the bow and stern of the vessel or convoy may be of the radio-telephone type. 1. There shall be an independent alarm system enabling the accommodation, engine rooms and, where appropriate, the separate pump rooms to be reached. 2. The helmsman shall have within reach an on/off switch controlling the alarm signal; switches which automatically return to the off position when released are not acceptable. 3. The sound pressure level for the alarm signal shall be at least 75 dB(A) within the accommodation area. In engine rooms and pump rooms the alarm signal shall take the form of a flashing light that is visible on all sides and clearly perceptible at all points. Wheelhouses shall be equipped with an effective heating and ventilation system that can be regulated. On board vessels and convoys whose wheelhouse has been designed for radar navigation by one person and exceeding 86 m in length or 22,90 m in breadth it shall be possible for the helmsman to drop the stern anchors from his position. Retractable wheelhouses shall be fitted with an emergency lowering system. All lowering operations shall automatically trigger a clearly audible acoustic warning signal. That requirement shall not apply if the risk of injury which may result from the lowering is prevented by appropriate design features. It shall be possible to leave the wheelhouse safely whatever its position. ‘The vessel has a wheelhouse designed for radar navigation by one person’. 1. Engines and their ancillaries shall be designed, built and installed in accordance with best practice. 2. Installations requiring regular inspection, particularly steam boilers, other pressure vessels and their accessories, and lifts, shall meet the regulations applying in one of the Member States of the Community. 3. Only internal-combustion engines burning fuels having a flashpoint of more than 55 oC may be installed. 1. Engines shall be installed and fitted in such a way as to be adequately accessible for operation and maintenance and shall not endanger the persons assigned to those tasks. It shall be possible to make them secure against unintentional starting. 2. Main engines, auxiliaries, boilers and pressure vessels, and their accessories, shall be fitted with safety devices. 3. In case of emergency, it shall also be possible to shut down the motors driving the blower and suction fans from outside the space in which they are located, and from outside the engine room. 4. Where necessary, connections of pipes which carry fuel oil, lubricating oil, and oils used in power transmission systems, control and activating systems and heating systems shall be screened or otherwise suitably protected to avoid oil spray or leakages onto hot surfaces, into machinery air intakes, or other sources of ignition. The number of connections in such piping systems shall be kept to a minimum. 5. External high pressure fuel delivery pipes of diesel engines, between the high pressure fuel pumps and fuel injectors, shall be protected with a jacketed piping system capable of containing fuel from a high pressure pipe failure. The jacketed piping system shall include a means for collection of leakages and arrangements shall be provided for an alarm to be given of a fuel pipe failure, except that an alarm is not required for engines with no more than two cylinders. Jacketed piping systems need not be applied to engines on open decks operating windlasses and capstans. 6. Insulation of engine parts shall meet the requirements of Article 3.04(3), second paragraph. 1. It shall be possible to start, stop or reverse the ship's propulsion reliably and quickly. the oil and air pressure of the main engine reversing units, reversible transmissions or propellers. 3. Where vessels have only one main engine, that engine shall not be shut down automatically except in order to protect against overspeed. 4. Where vessels have only one main engine, that engine may be equipped with an automatic device for the reduction of the engine speed only if an automatic reduction of the engine speed is indicated both optically and acoustically in the wheelhouse and the device for the reduction of the engine speed can be switched off from the helmsman's position. 5. Shaft bushings shall be designed in such a way as to prevent the spread of water-polluting lubricants. 1. The exhaust gases shall be completely ducted out of the vessel. 2. All suitable measures shall be taken to avoid ingress of the exhaust gases into the various compartments. Exhaust pipes passing through accommodation or the wheelhouse shall, within these, be covered by protective gas-tight sheathing. The gap between the exhaust pipe and this sheathing shall be open to the outside air. 3. The exhaust pipes shall be arranged and protected in such a way that they cannot cause a fire. 4. The exhaust pipes shall be suitably insulated or cooled in the engine rooms. Protection against physical contact may suffice outside the engine rooms. 1. Liquid fuels shall be stored in steel tanks which are either an integral part of the hull or which are firmly attached to the hull. If so required by the design of the vessel, an equivalent material in terms of fire-resistance may be used. These requirements shall not apply to tanks having a capacity of no more than 12 litres that have been incorporated in auxiliaries during their manufacture. Fuel tanks shall not have common partitions with drinking-water tanks. 2. Tanks and their pipework and other accessories shall be laid out and arranged in such a way that neither fuel nor fuel vapours may accidentally reach the inside of the vessel. Tank valves intended for fuel sampling or water drainage shall close automatically. 3. No fuel tanks may be located forward of the collision bulkhead. 4. Fuel tanks and their fittings shall not be located directly above engines or exhaust pipes. 5. The filler orifices for fuel tanks shall be marked distinctly. 6. The orifice for the fuel tank filler necks shall be on the deck, except for the daily-supply tanks. The filler neck shall be fitted with a connection piece in accordance with European standard EN 12827:1999. Such tanks shall be fitted with a breather pipe terminating in the open air above the deck and arranged in such a way that no water ingress is possible. The cross-section of the breather pipe shall be at least 1,25 times the cross-section of the filler neck. If tanks are interconnected, the cross-section of the connecting pipe shall be at least 1,25 times the cross-section of the filler neck. This requirement shall not apply to tanks mounted directly on the engine. 8. Fuel pipes, their connections, seals and fittings shall be made of materials that are able to withstand the mechanical, chemical and thermal stresses to which they are likely to be subjected. The fuel pipes shall not be subjected to any adverse influence of heat and it shall be possible to inspect them throughout their length. 9. Fuel tanks shall be provided with a suitable capacity-gauging device. Capacity-gauging devices shall be legible right up to the maximum filling level. Glass gauges shall be effectively protected against impacts, shall be fitted with an automatic closing device at their base and their upper end shall be connected to the tanks above their maximum filling level. The material used for glass gauges shall not deform under normal ambient temperatures. Sounding pipes shall not terminate in accommodation spaces. Sounding pipes terminating in an engine or boiler room shall be fitted with suitable self-closing devices. Fuel tanks shall be safeguarded against fuel spills during bunkering by means of appropriate onboard technical devices which shall be entered in item 52 of the Community certificate. If fuel is taken on from bunkering stations with their own technical devices to prevent fuel spills on board during bunkering, the equipment requirements in (a) and paragraph 11 shall no longer apply. 11. If fuel tanks are fitted with an automatic shut-off device, the sensors shall stop fuelling when the tank is 97 % full; this equipment shall meet the ‘failsafe’ requirements. If the sensor activates an electrical contact, which can break the circuit provided by the bunkering station by a binary signal, it shall be possible to transmit the signal to the bunkering station by means of a watertight connection plug meeting the requirements of IEC publication 60309-1:1999 for 40 to 50 V DC, housing colour white, earthing contact position ten o'clock. 12. Fuel tanks shall be provided with openings having leak-proof closures that are intended to permit cleaning and inspection. 13. Fuel tanks directly supplying the main engines and engines needed for safe operation of the vessel shall be fitted with a device emitting both visual and audible signals in the wheelhouse if their level of filling is not sufficient to ensure further safe operation. 1. Lubricating oil shall be stored in steel tanks which are either an integral part of the hull or which are firmly attached to the hull. If so required by the design of the vessel, an equivalent material in terms of fire-resistance may be used. These requirements shall not apply to tanks having a capacity of no more than 25 litres. Lubricating oil tanks shall not have common partitions with drinking-water tanks. 2. Lubricating oil tanks and their pipework and other accessories shall be laid out and arranged in such a way that neither lubricating oil nor lubricating oil vapour may accidentally reach the inside of the vessel. 3. No lubricating oil tanks may be located forward of the collision bulkhead. 4. Lubricating oil tanks and their fittings shall not be located directly above engines or exhaust pipes. 5. The filler orifices for lubricating oil tanks shall be marked distinctly. 6. Lubricating oil pipes, their connections, seals and fittings shall be made of materials that are able to withstand the mechanical, chemical and thermal stresses to which they are likely to be subjected. The pipes shall not be subjected to any adverse influence of heat and it shall be possible to inspect them throughout their length. 7. Lubricating oil tanks shall be provided with a suitable capacity-gauging device. Capacity-gauging devices shall be legible right up to the maximum filling level. Glass gauges shall be effectively protected against impacts, shall be fitted with an automatic closing device at their base and their upper end shall be connected to the tanks above their maximum filling level. The material used for glass gauges shall not deform under normal ambient temperatures. Sounding pipes shall not terminate in accommodation spaces. Sounding pipes terminating in an engine or boiler room shall be fitted with suitable self-closing devices. 1. Oils used in power transmission systems, control and activating systems and heating systems shall be stored in steel tanks which are either an integral part of the hull or which are firmly attached to the hull. If so required by the design of the vessel, an equivalent material in terms of fire-resistance may be used. These requirements shall not apply to tanks having a capacity of no more than 25 litres. Such oil tanks shall not have common partitions with drinking-water tanks. 2. Such oil tanks and their pipework and other accessories shall be laid out and arranged in such a way that neither such oil nor such oil vapour may accidentally reach the inside of the vessel. 3. No such oil tanks may be located forward of the collision bulkhead. 4. Such oil tanks and their fittings shall not be located directly above engines or exhaust pipes. 5. The filler orifices for such oil tanks shall be marked distinctly. 6. Such oil pipes, their connections, seals and fittings shall be made of materials that are able to withstand the mechanical, chemical and thermal stresses to which they are likely to be subjected. The pipes shall not be subjected to any adverse influence of heat and it shall be possible to inspect them throughout their length. 7. Such oil tanks shall be provided with a suitable capacity-gauging device. Capacity-gauging devices shall be legible right up to the maximum filling level. Glass gauges shall be effectively protected against impacts, shall be fitted with an automatic closing device at their base and their upper end shall be connected to the tanks above their maximum filling level. The material used for glass gauges shall not deform under normal ambient temperatures. Sounding pipes shall not terminate in accommodation spaces. Sounding pipes terminating in an engine or boiler room shall be fitted with suitable self-closing devices. 1. It shall be possible to pump out each watertight compartment separately. However, that requirement shall not apply to watertight compartments that are normally sealed hermetically during operation. 2. Vessels requiring a crew shall be equipped with two independent bilge pumps which shall not be installed within the same space. At least one of these shall be motor driven. However, for vessels with a power of less than 225 kW or with a deadweight of less than 350 t, or where vessels not intended for the carriage of goods have a displacement of less than 250 m3, one pump will suffice which can be either manually-operated or motor-driven. Each of the required pumps shall be capable of use on each watertight compartment. However, the value d2 need not exceed value d1. For the calculation of Q2 l shall be taken to be the length of the longest watertight compartment. is the calculated internal diameter of the branch pipe, in (mm). 4. Where the bilge pumps are connected to a drainage system the drainage pipes shall have an internal diameter of at least d1, in mm, and the branch pipes an internal diameter of at least d2, in mm. Where vessels are less than 25 m in length the values d1 and d2 may be reduced to 35 mm. 5. Only self-priming bilge pumps are permitted. 6. There shall be at least one suction on both the starboard and port sides of all flat-bottomed, drainable compartments that are wider than 5 m.
7. It may be possible to drain the aft peak via the main engine room by means of an easily accessible, automatically closable fitting. 8. Branch pipes of single compartments shall be connected to the main drainage pipe by means of a lockable non-return valve. Compartments or other spaces that are capable of carrying ballast need to be connected to the drainage system only by means of a simple closing device. That requirement shall not apply to holds that are capable of carrying ballast. Such holds shall be filled with ballast water by means of ballast piping that is permanently installed and independent of the drainage pipes, or by means of branch pipes that can be connected to the main drainage pipe by flexible pipes or flexible adaptors. Water intake valves located in the bottom of the hold shall not be permitted for this purpose. 9. Hold bilges shall be fitted with gauging devices. 10. Where a drainage system incorporates permanently installed pipework the bilge-bottom drainage pipes intended to extract oily water shall be equipped with closures that have been sealed in position by an inspection body. The number and position of those closures shall be entered on the Community certificate. 11. Locking the closures in position shall be regarded as equivalent to sealing in accordance with paragraph 10. The key or keys for the locking of the closures shall be indicated accordingly and kept in a marked and easily accessible location in the engine room. 1. It shall be possible to store, on board, oily water accumulated during operation. The engine-room bilge is considered to be a store for this purpose. 2. In order to store used oils there shall, in the engine room, be one or several specific receptacles whose capacity corresponds to at least 1,5 times the quantity of the used oils from the sumps of all of the internal combustion engines and transmissions installed, together with the hydraulic fluids from the hydraulic-fluid tanks. The connections used in order to empty the receptacles referred to above shall comply with European standard EN 1305:1996. 3. Where vessels are only used on short-haul operation the inspection body may grant exceptions from the requirements ofparagraph 2. 1. The noise produced by a vessel under way, and in particular the engine air intake and exhaust noises, shall be damped by using appropriate means. 2. The noise generated by a vessel under way shall not exceed 75 dB(A) at a lateral distance of 25 m from the ship's side. 3. Apart from transhipment operations the noise generated by a stationary vessel shall not exceed 65 dB(A) at a lateral distance of 25 m from the ship's side. 1. Where there are no specific requirements concerning certain parts of an installation the safety level shall be considered satisfactory where those parts have been produced in accordance with a European standard in force or in accordance with the requirements of an approved classification society. The relevant documents shall be submitted to the inspection body. types of cable and information on conductor cross-sections. It is not necessary to keep such documents on board unmanned craft, but they shall be available at all times with the owner. 3. The equipment shall be designed for permanent lists of up to 15° and ambient inside temperatures of between 0 and + 40 °C, and on the deck between - 20 °C and + 40 °C. It shall function perfectly within those limits. 4. The electrical and electronic equipment and appliances shall be fully accessible and easy to maintain. 1. Where craft are fitted with an electrical system, that system shall in principle have at least two power sources in such a way that where one power source fails the remaining source is able to supply the power consumers needed for safe navigation for at least 30 minutes. 2. Adequate rating of the power supply shall be demonstrated by means of a power balance. An appropriate simultaneity factor may be taken into account. 3. Independently of paragraph 1, Article 6.04 shall apply to the power source for the steering system (rudder installations). Only explosion-proof electrical equipment (certified safety) may be installed in spaces where potentially explosive gases or mixtures of gases are likely to accumulate, such as compartments dedicated for accumulators or the storage of highly inflammable products. No light switches or switches for other electrical appliances shall be installed in these spaces. The protection from explosion shall take account of the characteristics of the potentially explosive gases or mixtures of gases that are likely to arise (explosion-potential group, temperature class). 1. Systems under a voltage of more than 50 V need to be earthed. 2. Metal parts that are open to physical contact and which, during normal operation, are not electrically live, such as engine frames and casings, appliances and lighting equipment, shall be earthed separately where they are not in electrical contact with the hull as a result of their installation. 3. The casings of mobile power consumers and portable devices shall, during normal use, be earthed by means of an additional earthing conductor that is incorporated into the power cable. That provision shall not apply where a protective circuit-separation transformer is used, nor to appliances fitted with protective insulation (double insulation). Where ≤ 30 mA default current circuit breakers are used. for special on-board installations such as radio and ignition systems. two-conductor systems that are insulated from the hull (L1/L2/PE). three-conductor systems with earthing of the neutral point using the hull return principle, however, that shall not be allowed for terminal circuits (L1/L2/L3/PEN). 3. The inspection body may allow the use of other systems. 1. Incoming supply lines from shore networks or other external networks to the installations of the onboard network shall have a permanent connection on board in the form of fixed terminals or fixed plug sockets. The cable connections shall not be subjected to any pulling load. 2. The hull shall be capable of being earthed effectively when the connection voltage exceeds 50 V. The earthing connection shall be specially marked. 3. The switching devices for the connection shall be arranged such as to prevent the concurrent operation of the onboard network generators and the shore network or another external network. A brief period of concurrent operation shall be permitted when changing from one system to another without a break in voltage. 4. The connection shall be protected against short circuiting and overload. 5. The main switchboard shall indicate whether the connection is live. 6. Indicator devices shall be installed to enable comparison of polarity in the case of direct current and phase sequence in the case of three-phase alternating current, between the connection and the onboard network. the type of current and the nominal voltage and, for alternating current, the frequency. 1. When power is supplied to other craft, a separate connection shall be used. If power sockets rated at more than 16 A are used to supply current to other craft, devices (such as switches or interlocks) shall be provided to ensure that connection and disconnection can take place only when the line is dead. 2. Cable connections shall not be subjected to any pulling load. 3. Article 9.08, paragraphs 3 to 7, shall apply mutatis mutandis. 1. Generators, motors and their terminal boxes shall be accessible for inspections, measurements and repairs. The type of protection shall correspond to their location (see Article 9.03).